This is an adventure for 4 battle-level 1 warriors. A gamemaster is required to run this adventure. The gamemaster should read this adventure carefully before running it. If you are a player don't read any further. The gamemaster will provide you with any information necessary. If some of the monsters in the adventure are too tough or too easy for the warriors to kill, simply replace them with something more appropriate. Be careful when replacing gamemaster characters though, since these might be essential to the game. Instead of actually replacing such a character it might be a good idea to change some of the characteristics instead, i.e. toughness, wounds, armor etc. 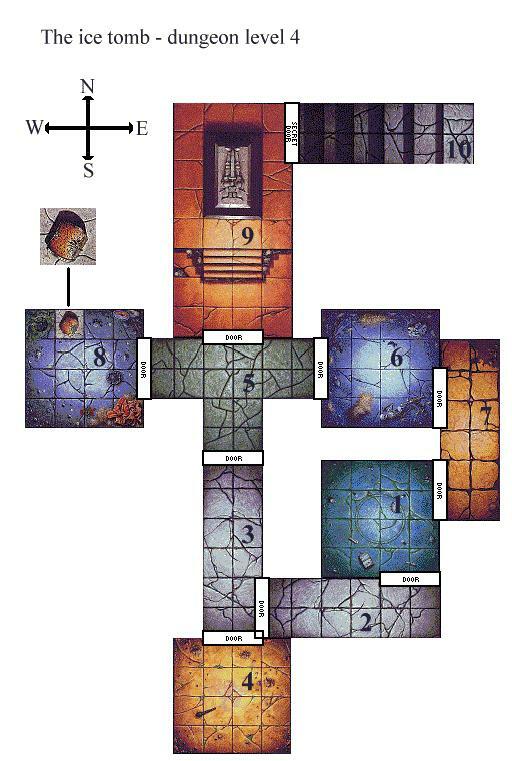 For each dungeon level in this adventure, there is a specific unexpected events table. When an unexpected event occurs, roll on the appropriate table instead of using the ordinary table included in the roleplay book. A few hundred years ago a mighty skaven horde led an attack on the dwarf keep of Karak-Varn. Knowing that the outcome of the battle could be nothing else but victory for the ratmen, the ruler of the keep, Thorgrim Steelfist, made a terrible but necessary decision. Rather than being captured and tortured by the skaven to reveal the location of his great treasure, Thorgrim let himself be frozen in an unbreakable block of ice, thus taking the secret of the location of his treasure with him. After having frozen him in a magically enchanted ice tomb, Thorgrims priests carried the tomb far into the dungeons of Karak-Varn. During the last days of the skaven siege they barely managed to escape before the last dwarf armies were defeaten, and the skaven invaded the keep. To this day, Thorgrim still lies frozen in the halls of what has now become a dark army stronghold. The warriors have been hired by the descendants of the priests of Thorgrim, who are bound by holy oath to revive their king. They have promised the warriors a great deal of treasure, should they bring Thorgrim back alive from the cursed skaven halls. The warriors have been given the kings signet ring, which is the only thing that can break down the enchanted ice tomb in which Thorgrim is trapped in stasis. If the warriors succede it is up to you as the gamemaster to see that the descendants of the priests give them a suitable reward for their efforts. If the warriors have fled cowardly from every challenge they have gotten, the reward should be small. However, if they have risked their lives again and again, the reward they receive should be great. This is where the adventure begins. In this level the warriors will face the guards of the entrance of the very skaven lair. The guard consists of the skaven chieftain Ashin, and the small band of skaven which he commands. Ashin has a ring that will be of vital importance to the warriors later in the adventure. The warriors are now actually entering the domain of the dark army. To procede to level 3 the warriors must defeat 3 minotaurs and then solve a small puzzle that involves Ashin's ring. As the warriors proceed further down the halls of Karak-Varn, they begin to meet all manner of foul monsters. At level 3 the warriors will be up against a skaven warlock and his legion of skaven. Furthermore, the warriors will face the halls of fate. This is the final dungeon level, in which the warriors will find Thorgrims tomb. A grim skaven stormvermin champion and his minions have been elected as the guardians of the tomb, and they will do everything possible to stop the warriors from freeing the dwarf king. You are standing at the beginning of a corridor that leads into the darkness. A cold wind blows from the caves that await you. You can't help thinking of the horrors that might lie inside this grim fortress. GM: This is where the warriors begin their adventure. The light in the lantern seems to struggle with the darkness that surrounds you. Just ahead on the floor lies the skeleton of a dwarf . There are three possible exists. Having said this, the skeleton falls to the floor. As you open the door, eight skaven warriors turn their heads and stare at you, clearly surprised. A weapon rack leans against the wall in the northwest corner. GM: There are eight skaven in the room. They should be placed as soon as the warriors open the door. If a warrior searches the weapon rack, the only useful thing that he will find is a sword of might (dungeon room treasure table, weapons and armour number 35). The humid air in this corridor is overwhealming. As you enter the corridor you start to feel a bit dizzy. GM: The air in the corridor is actually sleeping gas. For every whole turn a warrior spends in the corridor, that warrior must take a willpower test to see if he falls asleep. If so, the warrior sleeps for two whole turns. When a warrior awakens, reduce his wounds by two points. The gas comes from a small hole in the south wall. Any warrior can stop the gas by finding the hole and sticking a stone, a rag or something else in it. If this is done it takes 1 whole turn for the gas to clear, and until then, the warriors still have to make the willpower tests. The room appears to be empty, except for a chest standing in the northwest corner. GM: This is really the nest of 10 giant spiders. They all sit on the ceiling ready to sweep down on the warriors. As soon as all the warriors are in the room the giant spiders will ambush them. The spiders will automatically succeed in ambushing the warriors. All the giant spiders must ambush the warriors at once. If a warrior performs a successful search of the room, he will find 6D6 x 10 gold and a sword of stone (dungeon room treasure table, weapons and armour number 21) hidden away in a small niche in the north wall. The chest is unlocked and empty. This is the fighting pit. Two minotaurs are in the pit, fighting over something, but as you enter the room, they stop their infighting and turn their attention to you. GM: Place the two minutaurs in the fighting pit as soon as the warriors enter the room. One of the minotaurs has a talisman of jet (dungeon room treasure table, magic items number 16) around his neck. The door in the west wall is unlocked. It is a actually a magical portal. When a warrior opens the door, tell him that he stands before a portal that leads into the warp. If a warrior enters it, he is teleported to any square on any board section that has already been discovered by the warriors (GM decides where, but a player may not get lost in the dark because of this). However, a player can also be sucked into the warp unwillingly. For every turn a warrior spends in a square adjecant to the the portal there is a chance of 4+ on a D6 that he is sucked into the warp. Of course, a warrior can only be sucked into the warp when the door is open. If a warrior has been sucked into the warp, treat this just as if he had entered the portal by himself. As you open the door you notice that the room is very dark. You almost can't see your surroundings. GM: Seven skaven clanrats await the warriors. Due to the lack of light in the room they are able to ambush the warriors. They will ambush the warriors as soon as they have all entered the room. For this purpose each skaven is given an ambush value of 5+. A secret door exists in the north wall. It is opened by pressing a very small button in the east wall, however. Furthermore, the button is consealed some plants growing out of the wall, and this only makes it more difficult to find. 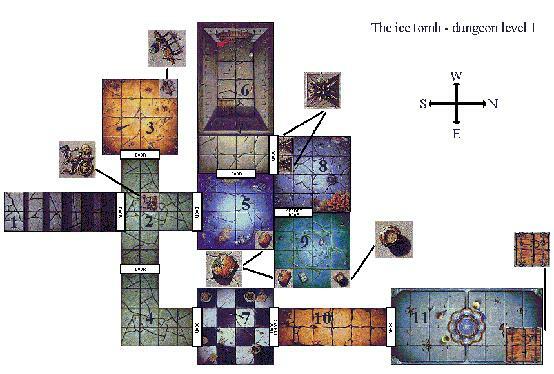 Therefore, when a warrior searches the room, roll the dice as usual for finding the secret door, and then make a separate roll for finding the button with a -1 modifier. After opening the door you see six goblin archers standing across the room, their bows pointing in your direction. A foul stench inhabits the room. GM: Place the goblins as soon as the warriors open the door. There are two pit traps in the room. When a warrior steps onto one tell him that the floor beneath him suddently gives in. As the gamemaster, you decide how to resolve this event. You may want to have a look at page 151 in the roleplay book for more info on spiked pits. There is a secret door in the east wall. As you open the secret door a swift gust of wind sweeps past you. The room is infested with all manner of foul minions. A closed chest is placed in the southeast corner of the room, and in the northeast corner stands a barrel. GM: Place four giants bats, three giant rats and five giant spiders in the room as soon as the warriors open the secret door. The chest is unlocked. It contains three potions of healing (dungeon room treasure table, magic items number 35). The barrel contains 12D6 x 10 gold. Furthermore, there is a light armour (+2 toughness) hidden in a small room in the north wall. The corridor ends at a stout wooden door. Upon opening the door to this room you find yourself standing face to face with a skaven chieftain and his personal guard. In the middle of the room there is a fountain, and in the northeast corner there is a trapdoor. GM: Besides from Ashin there are 12 skaven in the room. Place all these monsters any way you like as soon as the door to the room is opened. Ashin is a skaven chieftain, and the profile for such a character can be found on page 110 in the roleplay book. However, do notice that Ashin also posesses an amber ring. This is a ring of protection, and it gives him +2 toughness. The trapdoor is open and behind it are the stairs that lead down to dungeon level 2. If the warriors survive, make sure that they at least notice Ashin's ring before proceeding to level 2, as it will be of vital importance to them later. Ahead of you the stairway ends. An exit tothe south leads further into the caverns of Karak-Varn. GM: This is where the warriors begin. As you open the door you are faced by a small skaven guard patrol. Otherwise the room is completely empty, except for a slime pit in the northeast corner. GM: There are four skaven in the room. Place these four skaven soon as the door is opened. Four more skaven hides in the shadows, ready to ambush the warriors at your (GM's) request. Being the gamemaster, you decide when these four skaven will attack. For the purpose of performing their ambush, the skaven are given an ambush value of 5+. In the slime pit lie a pair of shiny golden bracers. If a warrior picks them up he suffers 1D6 wounds with no deductions for toughness, armour etc. This is because of the slime, which is an extremely corrosive acid. The bracers themselves give a warrior +1 toughness when worn. They may not be used by the wizard. In this corridor a patrol of six orc warriors and two orc archers stand guard. There are two other doors in the corridor, but the eastern door is blocked by a portcullis. GM: Place the orcs as soon as the door to the corridor is opened. Place the portcullis marker in the door to the east. The portcullis is locked, but it can be opened with the key from room 5. This is just an empty corridor. A large painting hangs on the west wall. GM: A secret door is hidden in the west wall behind the painting. Having opened the secret door, you now face 10 skaven warriors. The floor is covered with splintered bones. However, a particularly large pile of bones lie in the southwest corner. GM: Place the 10 skaven clanrats as soon as the warriors open the secret door. In the pile of bones a rusty iron key can be found. This is the key to the portcullis. In this room, six goblin warriors armed with spears and six goblin archers stand guard. Two chests lean against the east wall. GM: Place the goblins as soon as the portcullis has been raised. One of the chests contains two potions of healing (dungeon room treasure table, magic items number 35), 100 gold and an arrow of slaying (dungeon room treasure table, magic items number 14). The other chest contains 600 gold. In the corridor, a minotaur stands gaurd in order to prevent any intruders. GM: Besides from the minotaur, the room is empty. As you open the door, you see four goblin archers preparing their bows. 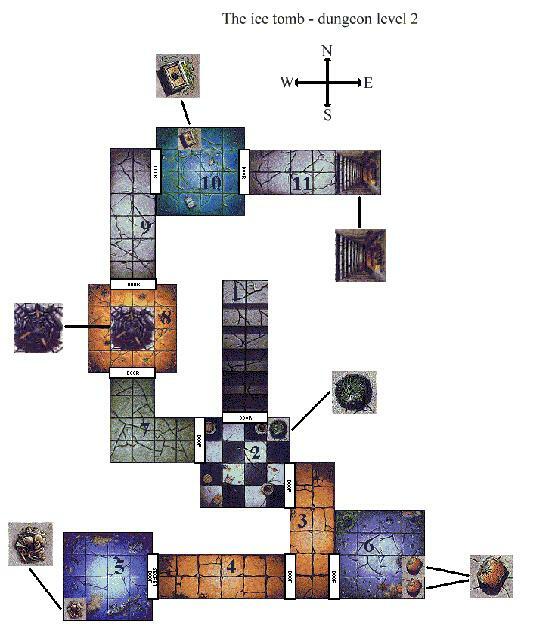 GM: Place the goblins on the four squares at the north end of the room. There's also a pit trap in the room. It is placed in the four middle squares of the room, as soon as any warrior treads onto any one of those squares. As the gamemaster, you decide how to resolve this event. You may want to have a look at page 151 in the roleplay book for more info on pit traps. If a warrior performs a successful search of the room, he finds 10D6 gold hidden away in a small hole in the south wall. GM: For every turn a warrior spends in this corridor, he should make a characteristic test (toughness perhaps?). If he fails the test he suffers 1 wound with no modifiers for toughness, armor etc. If a warrior performs a successful search of the room, he finds 1D6 x 10 gold lying in the southeast corner. As you open the door you stand face to face with three blood-crazed minotaurs. There is a heavy bronze door to the west. 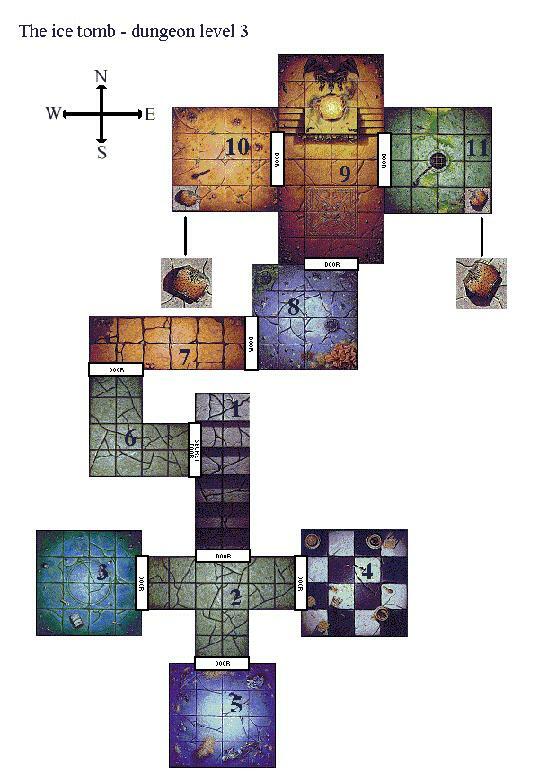 GM: Place the three minotaurs in any way you like, as soon as the warriors have opened the door to the room. Ashin's ring puzzle: On the middle of the bronze door the text "Ring for admittance" is carved out in crude skaven writing. On the left side of the door a small silver bell is attached to the wall. Under the bell there is a small, empty niche. The door has no handle. Of course, the warriors won't get anywhere ringing the bell. Actually, every time a warrior uses the bell, an electric charge emits from the door, and he suffers 3 wounds with no modifiers for toughness, armor etc. The words "ring for admittance" have another meaning. The warriors will have to place Ashin's amber ring in the niche. As soon as this is done, the door opens. This is the absolutely ONLY way to gain access to room 11 (the corridor). This corridor is particularly dark. Ahead of you are some stairs that seem to lead further into the dungeon. GM: Place the stairs down marker at the end of the corridor. The stairs lead down to dungeon level 3. The stairway ends at an iron door. GM: This is where the warriors begin. A secret door exists in the west wall. A quick burst of wind flies past you, as you open the door. You see four skaven guards. GM: Nothing is in the corridor besides the four skaven guards and three other doors. As you open the door to the room, you stand face to face with eight foul skaven guards. GM: Nothing to notice aside from the eight skaven guards in each room. The air in this corridor is warm, a bit steamy and very humid. You can't see where the warmth comes from, though. GM: If a warrior performs a successful search of the room, he finds 1D6 x 10 gold and a great shield (see page 29 in roleplay book for rules on a great shield) lying beneath a loose rock in the floor. As you enter the corridor you see nothing special. It is illuminated by a torch hanging on the wall. GM: A warrior may take the torch with him if he wishes. The torch will burn for 2D6 turns, and acts just as the lantern, i.e. allowing the warrior to explore. Upon opening the door you are confronted by a skaven warlock and his personal guard. GM: This is the lair of Raath. Raath is a skaven warlock, and the profile for such a character can be found in the roleplay book page 113. However, Raath is also equipped with a blessed sword (dungeon room treasure table, weapons and armour number 61). Aside from Raath there are 10 skaven clanrats in the room. Place all of the skaven any way you like, as soon as the warriors have opened the door to the room. If a warrior searches the room, he may find 10D6 x 5 gold in a shrine hidden away in a secret room in the west wall. The shrine is trapped with a dart (not poisoned). As the gamemaster it is up to you to resolve the event, should a warrior open the shrine. You may want to have a look at page 151 in the roleplay book for more info on dart traps. The room you are about to enter is very large. At the end of it, there are two sets of stairs that both lead to a small pedestal, on which there stands a large statue of a gargoyle. Before the statues feet there is a hole in the floor, from which a magical fire rages. There are no monsters in the room. GM: As soon as all the warriors have entered the room, the door slams shut behind them. Then the gargoyle statue becomes alive. The gargoyle does not attack. Instead it welcomes the warriors. The gargoyle then asks each warrior what fate he chooses. The path of force, or the path of wisdom. Each warrior must write their answer on a piece of paper, and then give it to you. After having received a note from each warrior, you may reveal what the warriors have chosen. The gargoyle now speaks again. Those who have chosen the path of force must leave the room via the eastern door, and those who have chosen the path of wisdom must leave the room using the western door. However, before anyone leaves the room, the gargoyle uses its magical powers to heal all the warriors to their full wounds. Also, any other characteristics that have been reduced (perhaps due to poison) are restored to the starting value. Do note that a characteristic can not be decreased, only increased. While the warriors are in this room, no unexpected events may occur. The room appears to be completely empty, except for a closed chest in the southeast corner. GM: Once all the warriors who have chosen the path of force have entered the room, the door slams shut behind them. The door is now impossible to open, even with spells. The chest is locked and can not be opened either. From out of nowhere, the servants of chaos suddently appear. Place one chaos warrior in the room for each warrior that is in the room. Once these foul servants of chaos have been beaten, the chest springs open automatically. In it lies the key for the door. The warriors may now leave the room. While the warriors are in this room, no unexpected events may occur. The room appears to be completely empty, except for a closed chest in the southwest corner. GM: Once all the warriors who have chosen the path of wisdom have entered the room, the door slams shut behind them. The door is now impossible to open, even with spells. The chest is locked and can not be opened either. From out of nowhere, a small goblin appears. Place the goblin anywhere in the room. He welcomes the warriors, and gives them four jewels. A diamond, a ruby, an emerald and a sapphire. Note that this is not one jewel per person. The warriors will receive four jewels no matter how many warriors are actually in the room. Now the goblin starts to explain what they must do. To be able to leave the room, the warriors must use the jewels that he has just given them. There are four slots in the door. The slots are marked 1, 2, 3 and 4. Each slot can contain a jewel. The warriors must find the right combination of jewels. Once all the jewels are placed in the correct slot, the chest will open, and in it the warroirs can find the key to the door. The goblin will name wrongly placed jewels as "skulls", and he will call jewels that are placed right for "crowns". Thus, every time the warriors have placed the jewels, the goblin will tell them what result they have achieved (fx. three skulls and one crown is the same as three placed wrong and one placed right). It takes one turn for a warrior to place all the jewels. Only one warrior may try at a time. Thus the warriors will be forced to "take turns". If no warrior is willing to try, simply draw a warrior counter. 1 wound when getting 1 or 2 skulls, 2 wounds when getting 3 or 4 skulls. 1wound when getting 1 skull, 2 wounds when getting 2 or more skulls. As the gamemaster you decide what the right combination is. While the warriors are in the room, no unexpected events may occur. And remember: What may appear complicated is often nothing more than a simple game of mastermind! As soon as the warriors have completed their tasks, they should meet up in room 9. The gargoyle will then teleport them to dungeon level 4. From now on, the warriors shouldn't be given free passage out of the dungeon to visit settlements. Since they have been teleported to a completely new location, the warriors will have no idea of how to leave the cave system. Cold air surrounds you. It is truly dark down here. The room is illuminated by only one torch on the east wall, and the light that it emits seems to struggle with the darkness for control. GM: This is where the warriors start after having been teleported to level four by the gargoyle. Place the warriors anywhere in the room. The corridor is dark indeed. No light exists here. You notice something particular. Namely that the corridor has no ceiling at all. Above you is a grey sky, covered with clouds. As you look down again, your eyes fall upon the six orcs in the room. GM: There are six orc warriors in the room. If a warrior searches the room he may find a rope (10 meters long) lying in one of the corners. As you open the door, five goblin archers ready their bows at the opposite end of the corridor. GM: Nothing aside from the five goblin archers. A foul stench inhabits this room, it's almost unbearable. Apparently this is a former skaven lair. Haystacks that the skaven obviously have used as beds lie spread around the floor. GM: If a warrior searches the room he finds 5D6 x 10 gold hidden under one of the haystacks. There are three other exits from this t-junction. In the room there is nothing except the remnants of an old alter, apparently of skaven manufacture. GM: The altar was designed so that the skaven could worship their god, the horned rat. Now however, the altar is abandoned. While the warriors are in the room the skaven god will detect that someone not of the faith has entered his sanctuary. At this point, if the warriors are doing too good and the adventure isn't much of a challenge to them, you might consider letting them suffer some kind of punishment from the god of the skaven, the horned rat himself. The corridor you are about to enter seems empty. GM: The corridor is actually completely empty. This might be a good place to spring an ambush on the warriors. As you open the door you stand face to face with the foul pestilence of skaven. GM: there are 2D6 skaven in the room. After these monsters are defeated, each warrior may roll once on the dungeon room treasure table. The warriors may decide if they want to roll on the weapons and armour table or the magic items table. These items can be found in the chest. The chest is unlocked. You have reached your goal. This is the room in which the king is trapped in his grave of ice. However, the room is infested with the worst of all skaven. GM: In this room is the skaven stormvermin warlord Darkon. The profile for Darkon can be found in the roleplay book page 112. Besides from Darkon there are 10 skaven clanrats in the room. Once the warriors have defeated the skaven, they may free king Thorgrim from the tomb by inserting his seal in a small slot in the ice. The king will awaken and thank them many times. Thorgrim knows of the secret door in the east wall. This is the exit that his priests used when placing him in the dungeon. Thorgrim will encourage the warriors to flee with him. However, if the warriors are not ready to leave at this ponit (perhaps something was left unexplored), the king will escape on his own, thus revealing the location of the secret door to the warriors. You have found a way out of the labyrinth. You quickly leave the foul dungeon behind you, as you exit into the light. GM: This is the warriors escape route. The adventure ends here!